A crew of six brave men and women have set sail through the cosmos on a two-and-a-half year mission to the red planet, their only connection to home is the email communications with friends and family. But, while still a month out from Mars, an asteroid knocks out half of the Bolo One spacecraft’s solar panels. The crew must find a suitable work-around, and fast, or face certain death. However, lack of electrical power is the least of their worries. Foreign agents are utilizing kidnapping and murder of the crew’s families, back on Earth, in an attempt to coerce them to abort the landing on Mars. Unknown to the crew, a foreign government’s robotic rover has made a discovery of immense value to all mankind, and they intend to land a human there first, no matter the cost. Knowing the danger of such a harrowing undertaking, each of the Bolo One’s crew members are prepared to give his or her life for the mission. But, who among them is prepared to sacrifice a loved one while traveling to Mars? Loss and loneliness draw the men and women closer together, resulting in romance among the stars. What they discover about themselves and the mission creates a spell-binding story that will keep you reading far into the night. Set in the very near future, Email From Mars: Outbound draws upon the real scientific aspects of what it will take to send a crew to Mars, from the design of the ship to the optimal launch date in 2018. 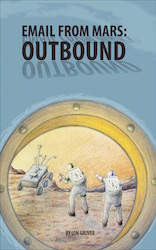 Outbound is the first book in the Email From Mars series. Email From Mars: Under Martian Law is nearly complete and sees many of the original characters return, plus introduces an entirely new crew and group of protagonists: Some on their way to colonize the red planet; others sent to work there; one sent by mistake. Other books by Lon Grover include: G. R. Grover & Son’s Anthology – 2nd Edition; and a Children’s Book – When I’m Grown Up And Older.